Unicorn Fuel Woods are suppliers of locally sourced dry, seasoned firewood logs and kindling based in Catton, Hexham, Northumberland. Dealing in hardwood and softwood for open fires and stoves offering you the finest logs delivered to your door. With customers all around the North East Unicorn Fuel Woods have an exceptional reputation for quality, ensuring only the very best firewood is supplied. We deliver to Tynedale and surrounding areas with free delivery within a 10 mile radius of Catton and only a small charge for deliveries further afield. Burning firewood is good for woodlands! Well managed woodlands need to be thinned to allow light in and encourage new growth - buying firewood helps support management which is good for habitat quality, biodiversity and the landscape. Burning wood is carbon neutral - releasing carbon that was stored when the tree grew. Providing we replant trees we've cut down, which in the UK we certainly do, it's sustainable. Buying firewood supports local jobs and communities in the North East, rather than the economies of oil producing countries. Take a look at the Unicorn Fuel Woods product range by clicking here or if you're ready to place an order go straight to the online order form. If you burn 15 wet logs during an evening in a typical 8kW stove, it would waste the same energy as putting a kettle on for 3 hours compared to burning dry wood...use dry, well seasoned logs! Despite what you may have heard, softwood makes perfectly good firewood on a wood burning stove, the only difference being you may have to load the stove slightly more frequently. Hardwood and softwood have roughly the same energy by weight - the difference is density. 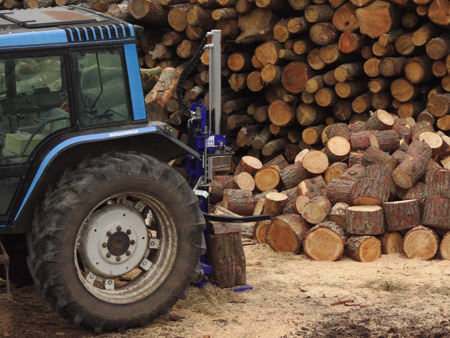 Therefore you need about 1.5 times the volume of softwood logs as hardwood to produce the same amount of energy. Burning softwood does not cause more chimney fires. This may have been the case for old-fashioned open fires, but modern stoves are easily hot enough to burn all the tar off AS LONG AS THE WOOD IS DRY. Any wet wood (hard or soft) will cause tar to build up, therefore dry softwood is far better than wet hardwood. Softwood tends to spark or spit slightly more than hardwood. Learn more by reading the Firewood Buyers Guide (PDF document size 2.3mb) either right click on the link and 'save link as' or click to view in browser.